This is a recent picture of the “Grand Old Building of Havelock Road”. The corridor was elevated above street level in the 1960s. The arrow points to the unit occupied by the Soh Beng Tee Construction Co.
Chinese around the world, including Singaporean-Chinese celebrate "Chap Goh Meh" to mark the closing of the traditional 15-day Chinese New Year celebrations. 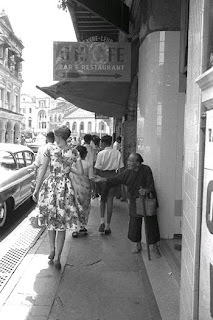 It would be interesting to have a chronological record (by year) of first person experience stories about "Chap Goh Meh". "Chap Goh Meh Through the Ages" would serve as a historical record of the different ways people celebrate this traditional Chinese festival in different places around the world. 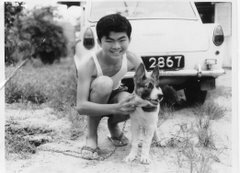 I remember "Chap Goh Meh" at Bukit Ho Swee kampung 50 years ago on 4th March, 1958 (Tuesday) when I was a 10-year-old kid. [The exact date is traced with the help of the Chinese calendar program on my Treo 650, not that I could remember the exact date so well]. The venue of the Bukit Ho Swee "heartland happening event” was at the 'Grand Old Building" (GOB) at Havelock Road, where shop Unit No. 715 to No. 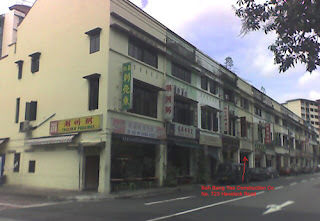 745, Havelock Road, Singapore are located. I found a best-view spot at the corridor of the coffee-shop at Unit No. 719 beside the Soh Beng Tee Construction Co. office at Unit No. 721. About 20 workers and the proprietor were having a grand "Chap Goh Meh" celebration dinner when I arrived at about 7:00 pm. There were crates and crates of firecracker stacked outside the office. 4 or 5 earthenware stoves with burning charcoal were also placed nearby. 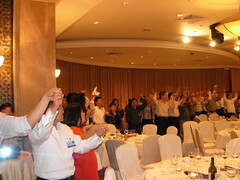 At about 7:30 pm, I heard 3 rounds of rousing shout of "Yam Seng" from the diners to signal the completion of the company dinner to celebrate another year of business prosperity. Several male workers then came out of the office. Their faces were red with too much brandy and beer and they appeared tipsy. They were laughing, apparently happy after an enjoyable and sumptuous dinner with alcohol drinks. The crates of firecracker were quickly opened. There were a few hundred packets of firecracker. The wrapper of each packet of the red firecracker was peeled off at the edge to expose the flint. The unpacking process was done by a group of 4 or 5 workers while another group lighted the firecrackers on the charcoal fire and threw them onto the road, packet by packet. It was a dangerous maneuver without any safety protection for the workers. The sound of the firecracker was deafening. Very soon Havelock Road at the GOB was covered in a cloud of dark smoke. Cars which passed through this stretch of the road have to keep the windows wound up. Packets of lighted firecracker accidentally thrown into an open car window could explode and cause injuries to the occupants. Most other vehicles prefer to use an alternative route instead of traveling through the “war zone” for safety reason. As the unpacking and unwrapping of the firecracker was completed, more workers joined in to throw the packets of firecracker. The tempo and speed of the cracker firing increased tremendously and I had to use my hands to cover my ears. I was also inhaling the toxic firecracker smoke. After a while, I noticed that the workers at the woodmaking factory across the road have also started to throw fire crackers onto Havelock Road. The factory must have had a profitable year and celebrated it with a "Chap Goh Meh" staff dinner in the same way as Soh Beng Tee, I guess. It was the first time in my life I had witnessed such a firecracker display. The workers at Soh Beng Tee continued drinking beer while firing the crackers. They were in high spirit and appeared to be having lots of fun, shouting loudly above the din to the people at the woodmaking factory, "Lets see who can fire the most firecrackers, who can last the longest" ... Oh My God, it was not just an ordinary firecracker display. It was a competition to see who has the most money (Oops...firecracker) to burn. When “showtime” was over at around 9:00 pm and the billowing cloud of firecracker smoke was drifted away by the wind, I slowly made my way home. There was a constant buzzing sound in my ears and I feared that I would become deaf. I was also stunned and shocked by what I heard and saw at the "Firecracker Fest". After the firecracker smokescreen disappeared, the bright, the full moon above Havelock Road on that “Chap Goh Meh” could again be seen. I did not know that it was the first and also the last time that I had the chance to witness such an event in Singapore.Please check out this website if you want to find out why firecracker was banned in Singapore. Recently, I visited the newly opened HortPark with my family. 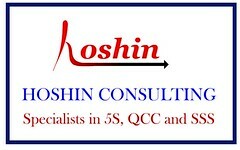 It is located at Hyderabad Road, opposite the Gillman Village. I think gardening enthusiasts would like this place. It is huge and divided into several sections each focusing on a different theme. 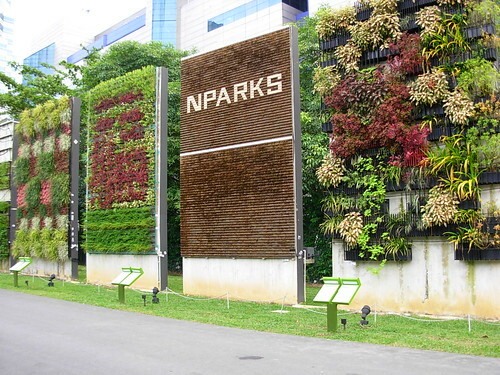 You can see many types of gardening plants there. I think my friends John and Ann Harper would have enjoyed this place. Unfortunately, last November, when they visited Singapore, I didn’t know about this place yet. Anyway, I saw some plants there which brought back memories of my kampong days. I like this picture (above) very much. It’s taken in the Recycling section. I wonder if young readers know what this container is. In Hokkien it’s called ‘tam pui’. British journalist, Neil Humphreys once joked that his Singaporean friends called him this name. In Cantonese, it’s ‘tam tong’. It is a spittoon. 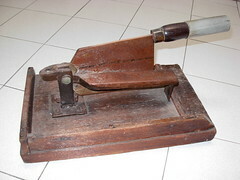 Older Chinese folks liked to use it. In fact, I read that President Nixon was surprised to find Chairman Mao Tse Tung using it during his historic visit to China. It also served as a potty for young children. 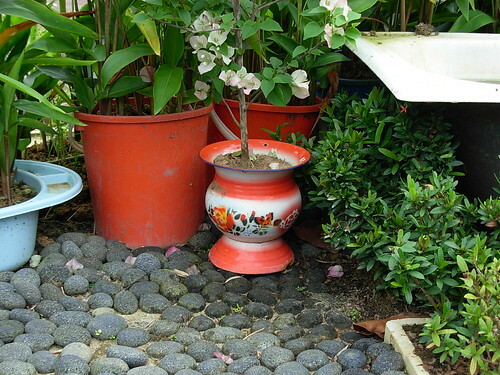 In the old days, kampong folks often used metal containers and pails as flower pots. In fact, I am not surprised if some homes still do. The second plant I noticed was an Elephant Climber (Argyreia nervosa). 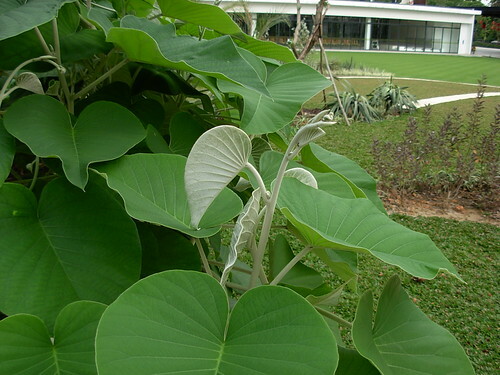 It has big leaves with silvery underside and purple flowers. I used to pluck the young unopened leaves to use as a book mark. We planted this creeper once and let it climb up a tall wooden frame at the side of our house. It served as a porch and garage for our car. Unfortunately, I do not have any photos of this. But in the 1969 photo below of my father, you can see part of an aluminum porch on the left. This was built to replace the wooden one with this climber. 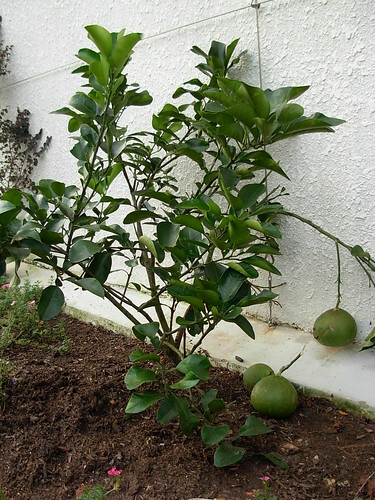 The third plant is a kind of pomelo tree - actually I am not sure of the name. Hope readers can help. Both the tree and its fruits are much smaller than the pomelo trees I have seen at a pomelo farm in Tambun near Ipoh. What I remember most is the nice smell of the leaves and the sharp needle-like thorns. We used to pluck a few pieces of leaves and place them in a tin box to keep our prized (fighting) spiders; which is called ‘pow fu’ in Cantonese or ‘hor sin hor’ in Hokkien. 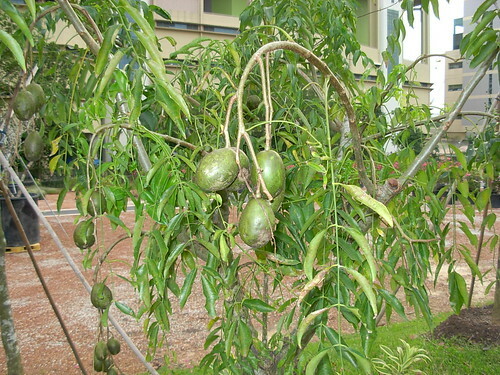 The last plant that caught my ‘nostalgic’ eyes was the buah long long which Chuck blogged about earlier. 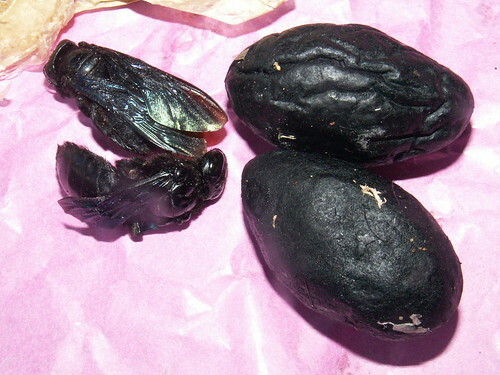 Finally, I have a photo to show you what the fruit looks like. 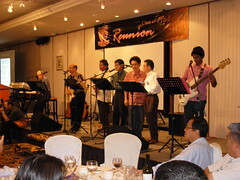 Last night I attended a reunion dinner. You must be wondering why we are having reunion dinner on Day 9 of Chinese New Year and not New Year’s Eve (除夕). 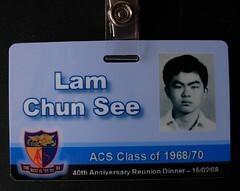 It was actually the 40th Anniversary Grand Reunion Dinner for the 1968 batch of ACS (Anglo Chinese School) old boys and girls (because it included the Pre-U batch of 1970). 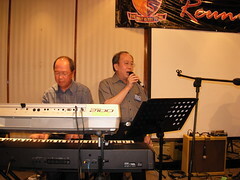 It was held at the Traders Hotel. The food was great: buffet-style; no sharks were harmed; and the atmosphere even better. We had a great time of nostalgia. The organizers put together an awesome slide show with many old photographs. 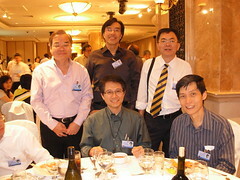 Several of our ex-teachers were present including our principal Mr Lee Hah Ing who was already in his nineties. A big thank you to the organizing committee who worked so hard to put together this event. They even provided the music and doubled as photographers for the evening. And I heard they even put in their own money to cover some of the costs. Below are some photos I took. As usual, my apologies for the lousy quality of the photos. 1) This is what I looked like 40 years ago. 2) Me with some of my classmates. Everyone liked my ACS tie. I was the only one wearing one. It was not an ordinary ACS tie. This one is an “IB tie” which is only worn by boys attending the International Baccalaureate classes. 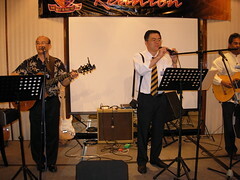 3) Live music provided some guys from our cohort. 4) They may have lost some hair, but certainly not the voices and musical talents. 5) I sang The Water is Wide. 6) Everybody sang the Auld Lang Syne and the ACS Anthem. By the way, whenever I attend my son’s inter-school canoeing competitions, I noticed that at the end of the prize presentation ceremony, the teams from ACSI and ACJC would get together and sing the ACS anthem. No other school seemed to do that. Says something about the ACS spirit doesn’t it? Working from home can be quite boring at times – lonely even. But occasionally some interesting things can be seen outside my window; such as these. 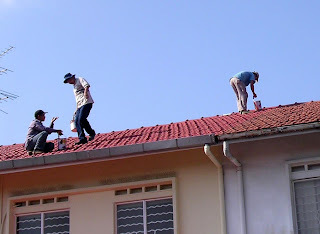 Once there were two Chinese (from China) workers doing some roofing work on my neighbour’s house. Suddenly they were startled by the crowing of our pet rooster. Yes, my children keep an old rooster (subject another blog for sure) in our backyard. Worker No. 1: Hey, did you hear a rooster crow? Worker No. 2: How can? In Singapore where to find a rooster? And then as if to prove him wrong, Mellow (that’s the name my children gave their beloved rooster) started to crow again. The two excited China workers kept peering down to try and see where the crowing came from. But of course they couldn’t because Mellow’s cage was blocked by our guava tree and back wall. Meanwhile, I was worrying that they would fall off the roof. Thanks to fellow Friend of Yesterday, Ivan Chew, Good Morning Yesterday and Lao Kok Kok's Times of My Life have become compulsory reading for some students at the University of San Francisco. Ivan has been invited to speak at the university's Digital Literary Cource. Thank you Ivan for helping to put our tiny red dot on the world map. 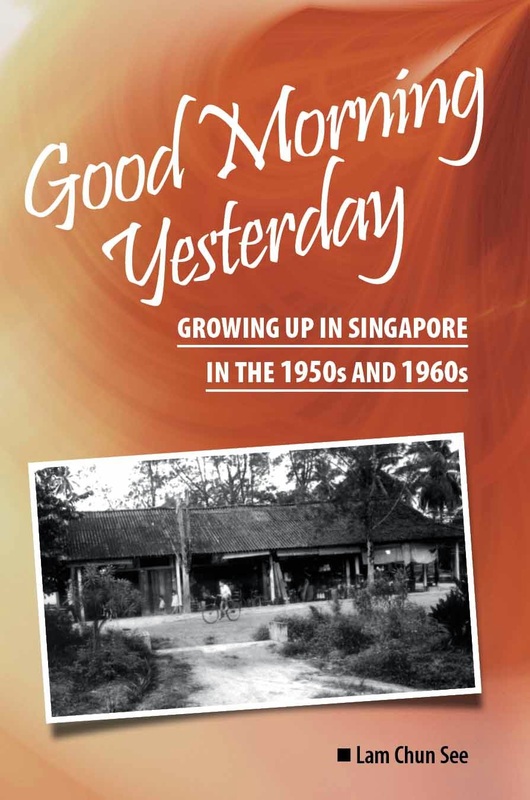 Be sure to tell them that GMY has not only helped to bridge the generation gap in Singapore, but also the cultural gap that existed a few decades ago between baby-boomer Britons and Singaporeans. 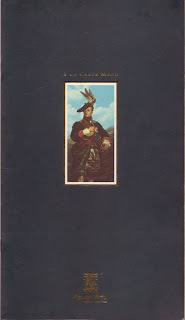 In fact, it was through GMY that two young Scotsmen who served in the First Queens Own Highlanders at Selarang Barracks in the early 60's, Tom Brown and Terry McGinnie became re-connected. Below are some photos I received from Terry. But he did not give any explanations to go with the photos; so maybe he or Tom can elaborate later in the comments section. This year I received many Chinese New Year greetings in the form of Chinese couplets or poems. The cutest one I thing is this one from K C Leong, an ex-colleague from Philips Audio factory in Toa Payoh. I met him when I gave that talk on blogging to Seniors at RSVP last November. We have not met since I left Philips in 1984. But seriously, if you want Singapore Pools to collapse, the best way is not to patronize them. Hope the day will come when people go to sports stadiums to queue for football tickets not 4D tickets as what was happening here. Below are some photos just received from Peter. They show the ingredients used for the Abacus Seeds dish, aka Ooh Ter Pan in Khek (Hakka) dialect . We often read in the newspapers and the blogosphere about ‘neighbours from hell’. Thankfully, my family are quite blessed to have wonderful neighbours. For example, every festive season, one of our neighbours, Mrs Yong, who is an excellent cook, never fails to send over some of her special dishes. Thus, even though nobody in our family can cook, our children are not deprived of the traditional Chinese dishes that their parents used to enjoy in the kampong days. One of my favourites is a dish called Suan-pan-zi (算盘子) or Abacus Seeds (pictured above) which we got to enjoy last night at reunion dinner. 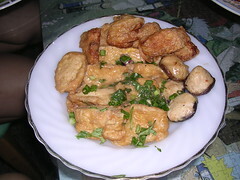 This, if I am not mistaken is a Hakka dish. It is not easily available at the food centres in Singapore. I once bumped into an old friend at a food centre in Ang Mo Kio Ave 4. Apparently, she had made the trip all the way from Bedok to enjoy this dish. I know of another stall at the Shunfu food centre near my former working place in Jalan Pemimpin that sells this dish. Nevertheless, I assure you that those you find at the food centres are no match for my neighbour’s. 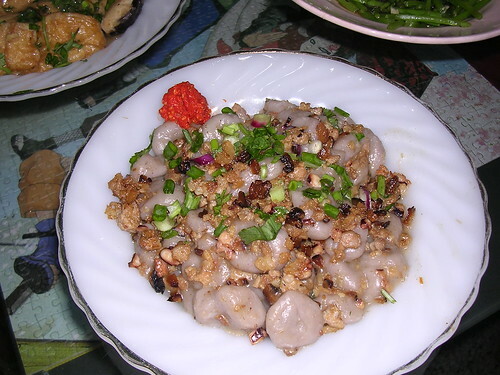 The Suan-pan-zi gets its name from the pieces of ring-like yam that look like the beads of an abacus. It is an auspicious dish because those who eat it will have a roaring business in the year ahead. 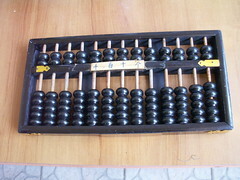 Their abacus which is traditionally used to tally your earning will not stop ‘clacking’. Other ingredients in the dish are minced pork and dried prawns. Of course it is best eaten with freshly pound chilli. The photos below show two other dishes that our neighbour sent over last night. 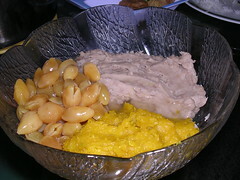 I am afraid, I do not know about the significance of these dishes as far as Chinese New Year traditions are concerned. I end with a note of advice to those readers who are good cooks; such as Aiyah Nonya. Cook a bit extra and pass them to your neighbours. This is the best way to promote good neighbourliness; something which seems to be sadly missing in modern-day, highly stressed Singapore society. Here’s wishing all readers a blessed Chinese New Year. What do you do when you have sore throat or a cough? What do you do when you have sore throat or a cough? Why, take some medical hornets and olives of course. Yes, that what my mother would get for us from the Traditional Chinese Medicine (TCM) shop or Yok Choy Poe (药材铺). In Cantonese, this medicine is called chook fong yok lam (竹蜂药榄). “Chook fong” is bamboo wasp or hornet, and “lam” is olive (橄榄). Yes, it’s really ugly looking. She would boil it in hot water and make us drink the water. Nowadays it’s difficult to buy such products. Maybe the bamboo hornet or wasp is an endangered species. Anyway, for the worthy cause of educating my younger readers, I bought a small packet to show you what it looks like. Hope my friend Siva and his fellow wildlife conservationists will not condemn me. By the way, does anyone know why TCM shops always wrap their products in pink paper? That’s a genuine question, not a quiz question. When we lived in the kampong, we had a TCM shop just a stone’s throw from our house. Guess what we called the shop owner? Yok Choy Poe lou (药材铺佬) of course! He was a Khek (Hakka). 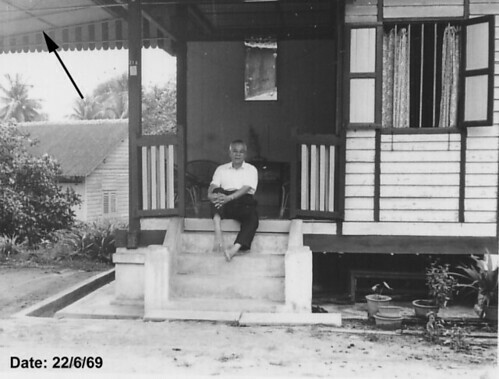 You may recall that our kampong was a Hokkien kampong. Practically everyone was Hokkien until when I was older. As far as I could remember, we were the only Cantonese family, and this TCM shop owner’s family was the only Hakka family. Across the road to the right, was a Hock Chew guy who ran a small coffee shop (with attap roof). Guess what we called him? Fook Chow lou of course! 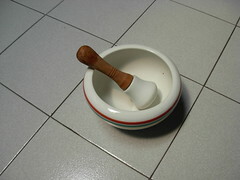 While I am at it, let me show you some photos of other equipment that the TCM practitioner uses. My father-in-law used to run such a shop in his younger days in Ipoh; which explains why my wife knows quite a bit about traditional Chinese herbs. When she was little, being one of the oldest children, she had to help out in the shop. Life was tough for her. After my father-in-law passed away, a couple of years ago, we found these gadgets among his things. 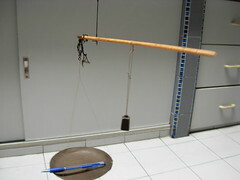 I will just show you the photos and you try to figure out what they are used for. That way, I don’t have to embarrass myself by giving the wrong ‘education’. Today where there are more avenues to pub, club, munch and dine apart from hot spots in the Orchard Road area. 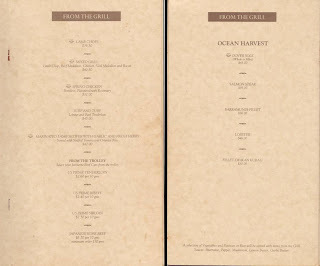 When I look back from my time, we have made immense progress in the F & B industry. So I don’t regret one bit that the “good ole days” have changed. Fortunately for me my father was able to take me to those wonderful joints like the GH Café down in Battery Road and Polar Café in High Street. On my own, I could not afford to pay for a bowl of Hokkien Prawn noodle soup, not until I earned my first buck. 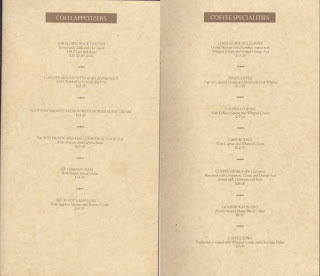 Whilst clearing my old junkies, I found this great menu list from the Goodwood Park Hotel to remind me of the time when I was able to sit down for a big nice meal at a time when only “Upperty Ang Mos” could do so effortlessly because it was charged to the company’s entertainment expense. It was not really difficult for me to finger through the menu list to place my order. 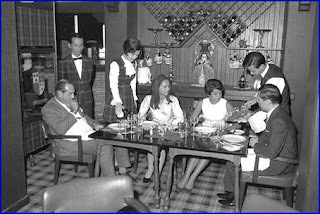 The Gordon Grill was famous for its tender juicy meat on the trolley; everybody knew about that. There was my old friend “Captain Wong” the Maitre d ‘Or who recommended me the best cut. “US Prime Tenderloin, 150 grams just right, medium to well done”, said Captain Wong. For the starter, I chose Scottish Smoked Salmon, remembering the unpleasant experience I had with the Scottish Haggis dish at the Tanglin Club bar. Then I decided on dessert which was cheese cake, a house brand of the hotel. You can bet nobody came close to this unless it was the Singapore Hilton. Today I was told that the Pan Pacific Hotel has the best of the lot. Then I rounded it with Irish coffee. A bottle of red white was not particularly exciting for me because I knew very little about wine – the “Year of Manufacture” and making suitable comments about its quality. I thought those things were very bourgeois. However if you like to know the reason, it was because a bottle would set me back at least $70. That was too much for the taste. Captain Wong had looked at me very much amused but I did not catch the hint. It was actually too much for a native Singaporean because our generation never had big appetite for western food. When the bill came, I crossed the $200 mark which was still within my initial estimates. How nice to sign-off with an American Express credit card: I never forgot NEVER TO LEAVE HOME WITHOUT IT. In those days having an American Express card was much sought-after than a DINERS CLUB. VISA and MASTERCARD had not made their presence felt until the 1980s. After I left the hotel, I came down with indigestion and a big bill to foot from next month’s salary. I just wonder how different was I from my children who are now young working professional with a bigger pay-packet than the time when I started working? Maybe if I was born 30 years later, I can join the “Sentosa Foam Party” but then I remember before there was a foam party, there was a wilder one called the “Wet T-Shirt Party” in Angeles City. The next article I will touch on clubbing, again because I found an old poster in my store-room.